As part of the culmination of PPP’s ‘Encounters‘ digital project, we would like to invite you to City Hall to be part of an event platforming young people’s creative work. The evening is being hosted by People’s Palace Projects and the GLA Peer Outreach Participation team, and will be an opportunity for young people to share information about their arts projects and hear how other groups are making creative interventions in their communities. The night will be interspersed with digital performances from young people that share opinions and ask questions about the society they live in. It would be fantastic if you could come and join the conversation between young people, artists and leaders working in the sector. 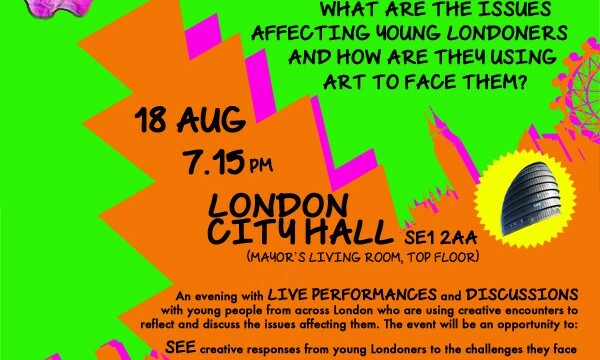 What are the issues affecting young Londoners and how are they using art to face them? – SPEAK your thoughts on the debate about how young people see London in the 21st century and what they need to get their voices heard.